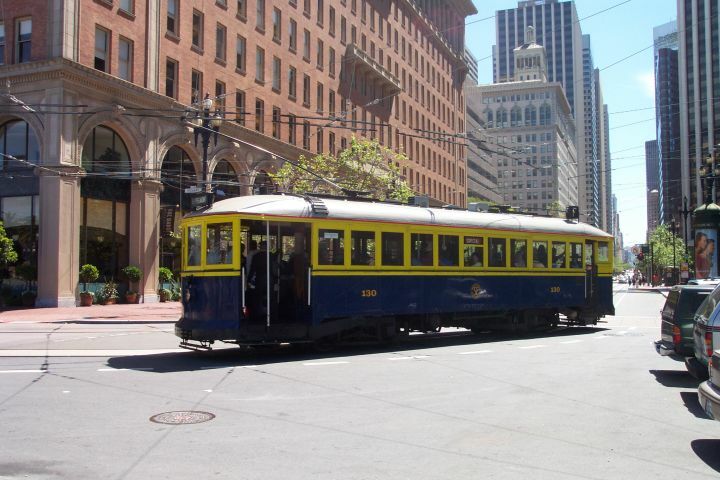 The San Francisco area streetcar, cablecar and interurban systems on the day line A of the San Francisco Municipal railway was discontinued. Al. The Alameda WS Woolsey St.
PVA Pleasant Valley Av. Y&H Yerba Buena & Hollis St.
A Ferry Bldg. – Market St. – Geary St. – 10th Av. - Fulton St.
C Ferry Bldg. – Market St. – Geary St. – 2nd Av. – California St. – 33rd Av. F Scott St. – Chestnut St. – Van Ness Av. – North Point St. – Columbus Av. – Stockton St. – Market St.
J Ferry Bldg. – Market St. – Church St. – 30th St.
K Ferry Bldg. 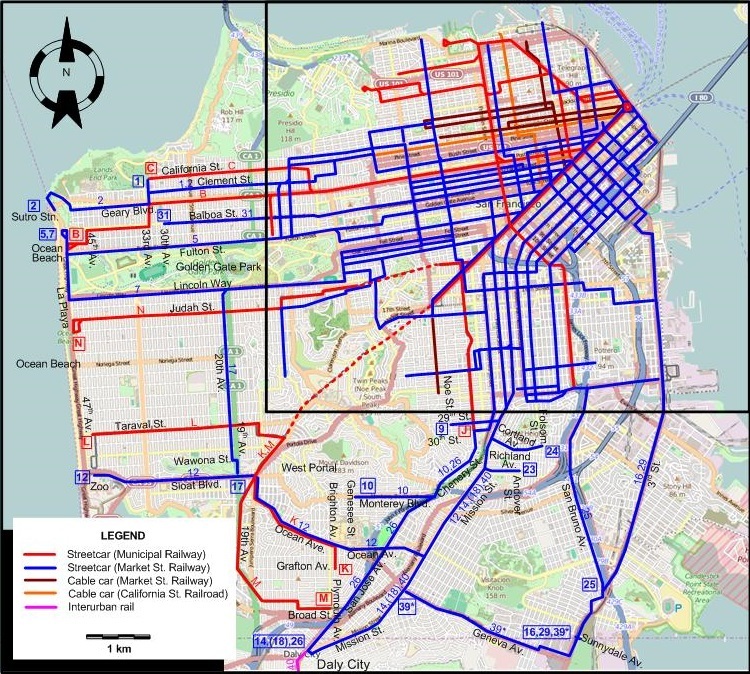 – Market St. – Twin Peaks Tunnel – West Portal – Ocean Av.- Brighton Av. – Grafton Av. L Ferry Bldg. 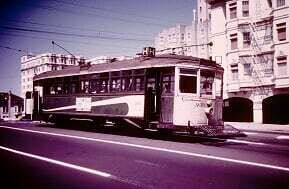 – Market St. – Twin Peaks Tunnel – Taraval St. – 47th Av. M Ferry Bldg. – Market St. – Twin Peaks Tunnel – West Portal – Ocean Av.- 19th Av. - Broad St. - Plymouth Av. 1 Ferry Bldg. – Market St. – Sutter St. – Presidio Av. – California St. – 6th Av. - Clement St. – 33rd Av. - California St.
3 Ferry Bldg. 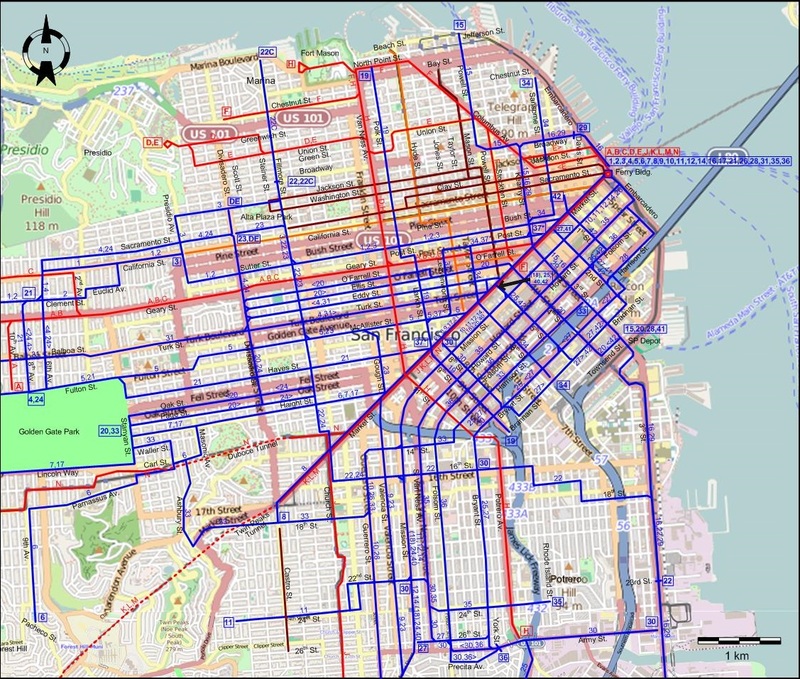 – Market St. – Sutter St. – Fillmore St. – Jackson St. – Presidio Av. - California St.
6 Ferry Bldg. – Market St. – Haight St. – Masonic Av. - Carl St. - Parnassus Av. – Judah St. - 9th Av. – Pacheco St.
8 Ferry Bldg. – Market St. – Castro St. - 18th St.
9 Ferry Bldg. – Market St. – Valencia St. – Mission St. - 29th St. - Noe St.
10 Ferry Bldg. – Mission St. – 14th St. - Guerrero St. - Chenery St. - Monterey St. - Genesee St.
11 Ferry Bldg. – Mission St. – 22nd St. - 24th St. - Hoffman Av. 17 Ferry Bldg. – Market St. – Haight St. – Lincoln Way – 20th Av. 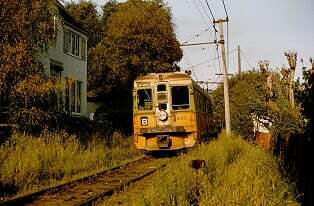 – Wawona St. - 19th St. - Sloat Blvd. 19 North Point St. - Polk St. - Post St. - Larkin St. - 9th St. - Brannan St.
21 Ferry Bldg. – Market St. – Hayes St. – Stanyan St. - Fulton St. – 8th Av. – Clement St.
22 Broadway – Fillmore St. – 16th St. – 18th St. – 3rd St. - 23rd St.
23 Divisadero St. – Sacramento St. - Fillmore St. – McAllister St. - Gough St. - Valencia St. - Mission St. - Richland Av. - Andover St.
24 Fulton St. (Golden Gate Park) - [6th Av.] [back: 8th Av. - Clement St.] - 6th Av. – Sacramento St. – Divisadero St. – Page St. [back: Oak St.] - Fillmore St. – 16th St. – Mission St. - Cortland Av. 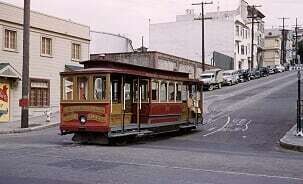 - Folsom St.
25 5th St. & Market St. – 5th St. – Bryant St. - Army St. - San Bruno Av. - 3rd St.
27 Market St. - 2nd St. - Bryant St. [back: 8th St. - Brannan St.] - Bryant St. - 26th St. - Mission St.
30 In 2 sections. Section 1: Market & 8th St - 8th St. - Bryant St. - 16th St. Section 2: Mission St. & 22nd St. - 22nd St. - S. Van Ness Av. - Army St. - 3rd St.
31 Ferry Bldg. 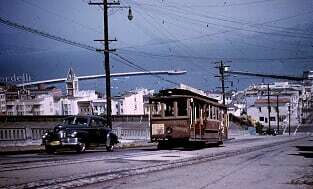 – Market St. – Eddy S. [back: Turk St.] – Turk St. – Balboa St. – 30th Av. 34 Chestnut St. - Sansome St. - Bush St. - Kearny St. - Post St. - Taylor St. - 6th St. - Brannan St.
35 Ferry Bldg. – Embarcadero - Howard St. - S. Van Ness Av. - 24th St. - Rhode Island St.
36 Ferry Bldg. – Embarcadero - Folsom St. - Precita Av. & York St.
37* Market St. - Post St. - Leavenworth St. - McAllister St. - Larkin St. - Market St.
42 California St. - 1st St. - Folsom St. - 2nd St. - Brannan St. - [3rd St. - SP Depot - Townsend St. - 4th St.] [back: Brannan St.] - Brannan St. - 5th St. - 5th St. & Market St.
* Route numbers 37 and 39 are fictitious, and are used here for the convenience of readers. 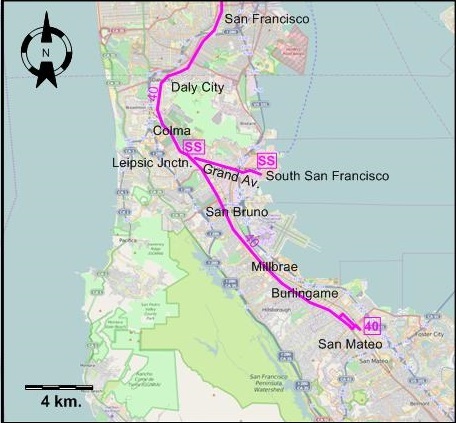 In reality, no route numbers were used for these routes. CABLE CAR ROUTES OPERATED BY THE MARKET STREET RAILWAY CO.
Powell - Mason Powell & Market – Powell St. – Jackson St. [back: Washington St.] - Mason St. – Bay St.
Sacramento - Clay Embarcadero - Sacramento St. [back: Larkin St. - Clay St.] - Sacramento St. - Fillmore St.
Castro 18th St. - Castro St. - 26th St.
CABLE CAR ROUTES OPERATED BY THE CALIFORNIA STREET CABLE RAILROAD CO.
California California & Drumm – California St. – Presidio Av. 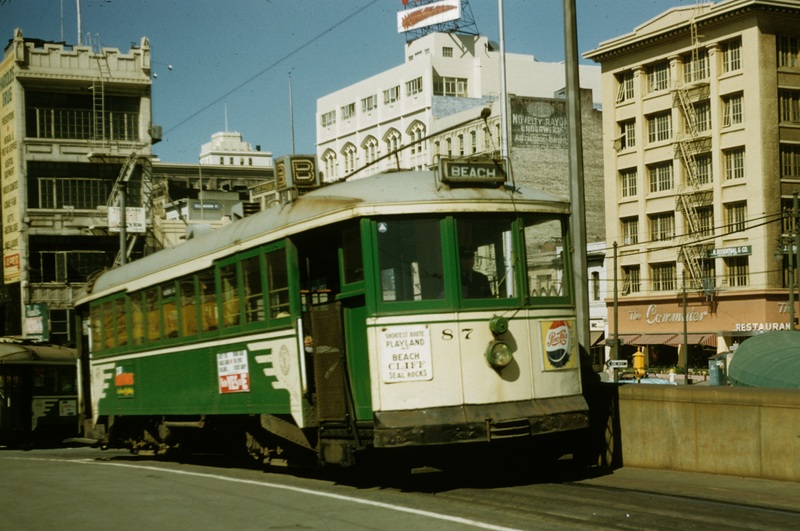 Hyde - O'Farrell O'Farrell & Market – O'Farrell St. – Jones St. – Pine St. – Hyde St. – Beach St.
A Key System Pier Terminal - Poplar St. - 11th St. (Oakland) - 3rd. Ave & E. 18th St. Note: Lettered route designations A-H for Key System interurban routes were only adopted in Nov. 1934, but are used here for the convenience of readers. 2 San Pablo - Ashby 2nd St. - Broadway [back: Washington St.] - San Pablo Av. - Ashby Av. 3 Grove & W 8th 7th St. - Pine St. - 8th St. - Washington St. - San Pablo Av. - Grove St. - University Av. - Oxford St. - Hearst Av. - Arch St.
4 Shattuck 1st St. - Broadway - Telegraph Av. - Shattuck Av. - University Av. - Oxford St. - Euclid Av. - Regal Rd. 5 Telegraph 1st St. - Broadway - Telegraph Av. - Bancroft Way - Oxford St. - University Av. - 3rd St.
10 Piedmont & Hopkins 35th Av. - Hopkins St. - 14th Av. - 18th St. - 12th St. - 12th St. [back: 13th St.] - Broadway - Piedmont Av. - Highland Av. - Crocker Av. 12 Grand & Hollis Yerba Buena & Hollis St. - Adeline St. - 24th St. - Market St. - 14th St. - Webster St. - Grand Av. - Oakland Av. 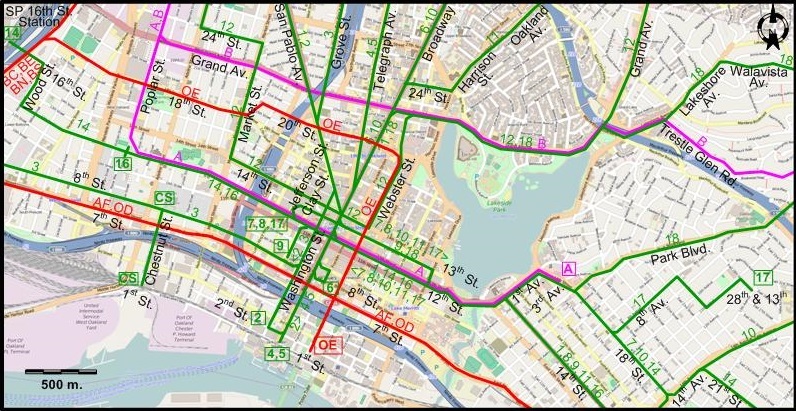 14 E 18th & W 16th SP 16th St. Station - 16th St. - Wood St. - 12th St. - 1st Av. - 18th St. - 14th Av. - 21st St. - 25th Av. - 26th Av. - 27th St. - Fruitvale Av. 18 Park Blvd. & Lakeshore Oakmore Rd. - Park Blvd. - 13th St. - 12th St. - Broadway - Grand Av. - Lakeshore Av. - Walavista Av. 22 Fruitvale Av. E 11th St. - Fruitvale Av. - Hopkins St.
23 23rd Av. E 14th St. - 23rd Av. - E 27th St.
24 Dwight Way University Av. - 6th St. (Berkeley) - Dwight Way - College Av. 25 Park Av. - Emeryville Halleck St. - Park Av. - San Pablo Av. 1 Not an official route designation. 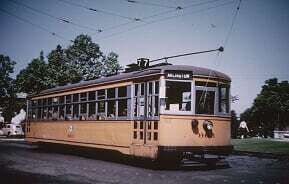 1934 Nov: Route 31 is renamed G (later K), in line with it being considered a Key System interurban route. OD Oakland, 7th St & Dutton Av. Line Oakland Pier Terminal - 7th St. - SP main line - Melrose - Bancroft Av. - Havenscourt - Dutton Av. OE Oakland, 18th St. Line Oakland Pier Terminal - SP 16th St. Station - 18th St. - 20th St. - Webster St. - 1st St. 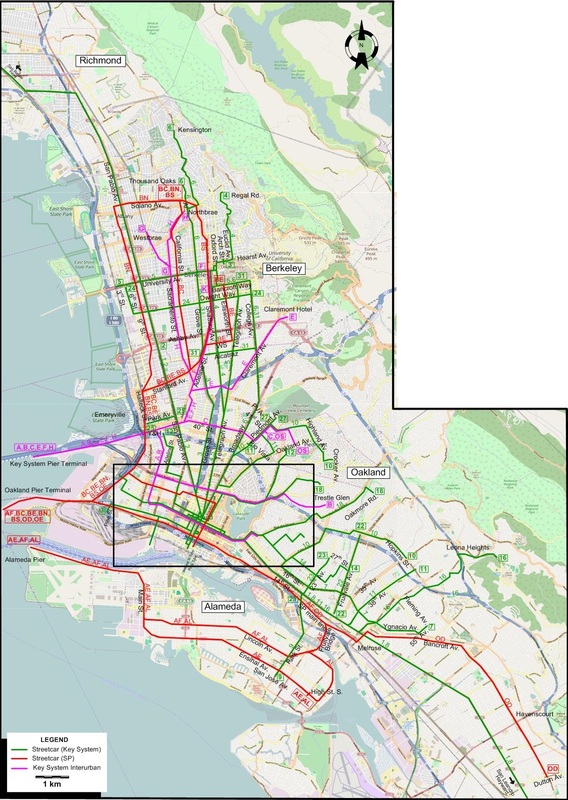 Note: The lettered route designations for the East Bay Electric Lines streetcar lines were not used by the operator, and are used here for the convenience of readers only. 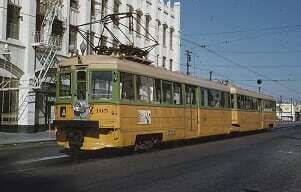 Streetcar lines (Oakland - Berkeley): ? km. Cable car lines: ? km. 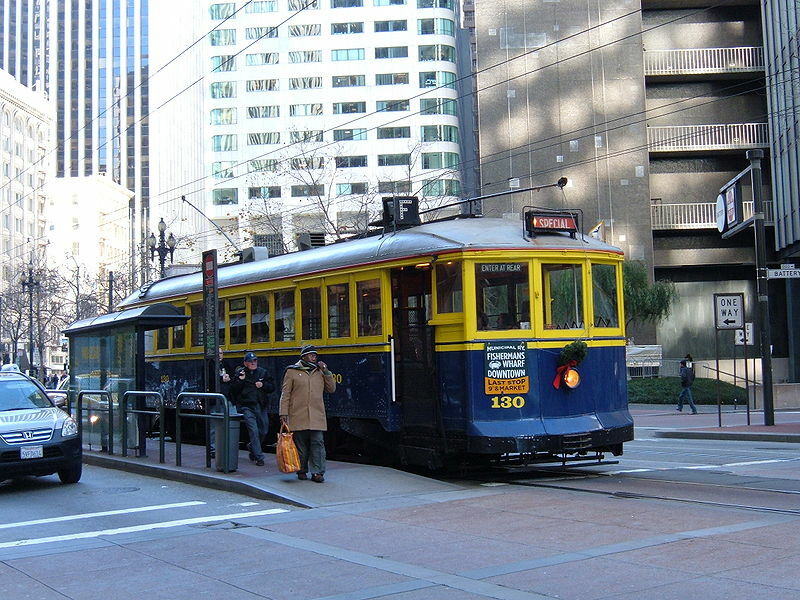 Interurban lines (Key System): ? km.